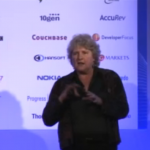 GraphConnect speaker Rebecca Parsons, CTO of ThoughtWorks discusses the changing landscape of data and how it’s optimized by organizations with Martin Fowler, Chief Scientist of ThoughtWorks, at QCon London 2012. Her talk at GraphConnect will also highlight the changes in the use and analysis of data, but will expand the applicability to beyond the bottom line. Examples will be provided on how data is used to track election violence, movement of people after a natural disaster, and attempts to predict famine and other humanitarian crises before they happen. Watch the video here.